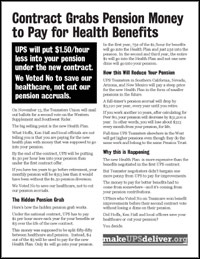 November 6, 2013: If you are a UPS Teamster moving into the new health plan in the West, millions of dollars will be diverted from your pension fund to maintain the health benefits you already have. On November 13, the IBT will mail out ballots to UPS Teamsters covered by the Western Region Supplement and the Local 177 Supplement. The sales pitch will be the health benefits improvements which were won thanks to the overwhelming contract rejection in the first vote in June. What members are not being told is that you are paying for the new health plan with money that was supposed to go to improve your pension benefit. By the end of the contract, UPS will be putting $1.50 per hour less into your pension than under the first contract offer. UPS Teamsters in Southern California, Nevada, Arizona, and New Mexico will pay a steep price for the new Health Plan in the form of smaller pensions in the future. If you have ten years to go before retirement, your monthly pension will be about $313 less than it would have been without the $1.50 pension diversion. Download the leaflet for more the details on this pension grab. The costly reduction in pension accruals is only happening to UPS Teamsters who are being moved into the new health plan. This includes full-timers in Southern California, Nevada, Arizona and New Mexico. UPS Teamsters elsewhere in the West will be getting higher pensions even though they do the same work and belong to the same Pension Trust. The big sales pitch has begun. A letter has gone out, with more PR to follow. A new website lists a summary of benefits, which are nearly identical to TeamCare benefits. But no mention of the fact that you will be paying from money that was supposed to go into your pension, to improve your benefit accrual. The ballots will be mailed on November 13 and counted on December 10. UPS Teamsters in New Jersey Local 177 will also have $1.50 per hour in new pension contributions diverted to pay for the new Health Plan. This pension grab will cost the Local 177 Fund $30 million in contributions by the end of the contract. Local 177 members will be asked to give up 30¢ per hour of their annual wage increases every year to fund a pension increase. The wage diversion from Local 177 members comes to $1.50 an hour by the end of the contract the same amount of pension money that is being diverted into the Health Plan to pay for the benefits.